Travelling with the team also means responding with gratitude and acquiescence to the generosity and hospitality of our hosts. When we are invited to someone’s house for dinner, or when our hosts provide a meal, it can be difficult to turn down that second or third piece of chicken or the extra helping of spaghetti squash. I know the sensible thing to do would be to plan all the meals ahead of time, to find ways to dine in healthier places (because having Subway for lunch more than once a week gets old quickly), to learn how to decline a second piece of cheesecake, and to develop healthier eating habits. But all of these take planning, time, and a lot of discipline – it requires a good amount of energy. I might be rationalizing this, but I think I have to save my energy for my ministry. When I am on the road, I am also susceptible to instant gratification, which make me less grateful and patient. My problem is not so much that I dislike waiting for something better. At times, I’m just short on the motivation to go the extra mile. Eating then becomes a task. I eat because I have to eat. And since I have to eat, I might as well go with something easy. I eat to avoid hunger, and although comfort food can be quite tasty, I don’t enjoy it as much as when I eat healthy food. If I am honest, I’d have to recognize that my unhealthy eating is not all about being in an unfamiliar place or travelling from city to city. Quite often, I lack the foresight and discipline to plan ahead and look at the long-term effects of an unbalanced diet. At times, I find myself struggling to think ahead and to plan accordingly – I react to what my schedule dictates. But that's not the whole story either. I won’t pretend I am just reacting to being on the road or having a crazy schedule. There are days when I am just plain lazy. A few weeks ago, I gave myself an hour and a half to go to the Farmer’s Market, buy organic food, and prepare a healthy meal. An hour later, I ended up reading a magazine and nuking a potato. The good news is that I washed the (loaded) baked potato with an organic beer – it has to count for something. Moments like that turn into a desolation – a decrease in faith, hope, and love. If you could see inside me, you could see how weak, worthless, and ugly I feel inside then. In those gloomy afternoons, I promise myself I’ve had my last baked potato in a long time, while knowing that it's only wishful thinking. That makes me feel pretty inadequate and lost. These feelings of worthlessness and hopelessness definitely aren’t from God; you can tell because they usually lead to a lack of charity towards myself. I was still living with the disappointment of having succumbed to another baked potato, when I stumbled upon a few tweets from one of my Tweeps (@knmarkford). Kristina commented on GMO OMG, a documentary on Genetically Modified Organisms (GMO’s). I was puzzled by her tweets and retweets because they kept broadcasting the same message: so many people have no idea what they are eating. Ignorance is bliss, without the bliss. For many of us, it is easier to stick with what is easy – even if it is not life-giving – than to live a more fulfilling life because of our fear to move forward and to commit to a new lifestyle. The message hit home for me. I find that I am often too attached to my lifestyle and my way of doing things, and this blinds me from the benefits of making tough choices and sticking with healthy priorities. This realization inspired me to ask Kristina if she was interested to talk about the topic via Skype. I was pleased when she accepted my request. My pleasure turned to delight when I discovered that she is married to someone with whom I went to college seminary in Miami (yup, it’s a small world after all – now please stop humming the song and go back to the post). What interested me the most about my conversation with Kristina was how quickly the topic changed from GMO’s to the reasons behind her healthy choices. After many years accented by unbalanced food choices and the convenience of fast food, she began to crave wholesome and more nourishing food. I was intrigued by what she told me next. As she started to develop healthier eating habits, her spiritual journey ran parallel and she found herself growing in steadfastness to go deeper in her relationship with the Lord. As she became more disciplined in what she ate, she also became more diligent in her prayer life. In that process, she sought and found the encouragement and company of like-minded people, but she also felt challenged by the sort of choices our culture promotes. Kristina delighted in telling me how life-giving her journey had been thus far. I delighted hearing her story. The patterns she described where analogous to some of my own experiences. Moments of diligence and steadfastness with regards to my diet also mark moments of spiritual growth. To be sure, there is always grace – whether I am having tacos or a kale salad – but I notice that when I make the effort to eat healthier, I feel stretched in the right way and inspired to continue growing. In terms of my appetites, I am always navigating between my raw desire for convenience and my longing for wholeness. The former leaves me radically isolated, while the latter prepares me to be radically transformed. Being on the road renews my perspective and moves me to gratitude. Life can thrive on bumpy roads and highways with construction. The road I enter upon invites me to be gentle with myself, but it also challenges me to seek the sort of nourishment that I need to be a better servant and lover. The highway I travel is an opportunity to discern and to love the hopeless wanderer in me in order to help him find that place where my hunger finds fulfillment. What an interesting perspective! As a nutritionist, I find this particularly encouraging! I think of the Old Testament passage where Daniel refused to eat meat but thrived on vegetables. God must surely mean for us to eat well to grow not only physically, but spiritually as well! I try to eat a primal/paleo diet and exercise. I have been good in the past. However, my work requires a long commute and i also find myself frequently travelling. 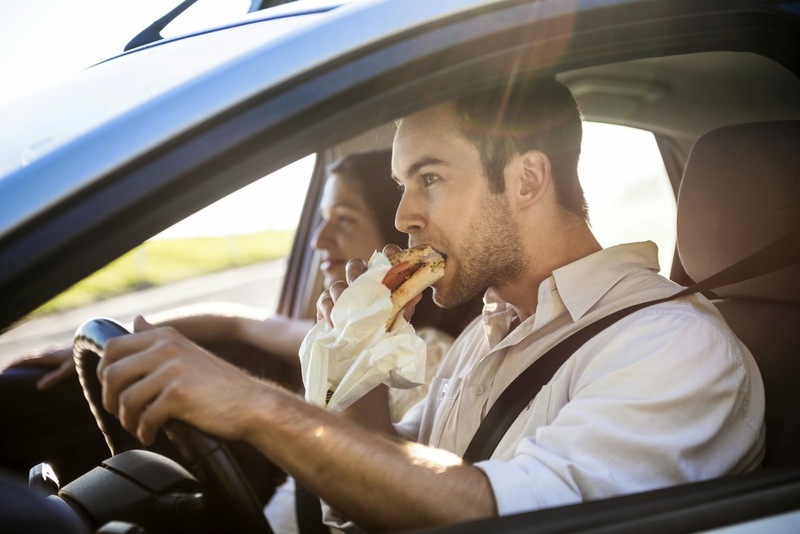 It is difficult to pre-pack lunches and grabbing snacks, and so on while on the road is just something that happens. Travelling is tiring and can take its toll. Most of us don't have an entourage like celebrities, politicians, and pope's which means that we basically live out of our car.